Rich in features, impeccable sound, convenient delivery. 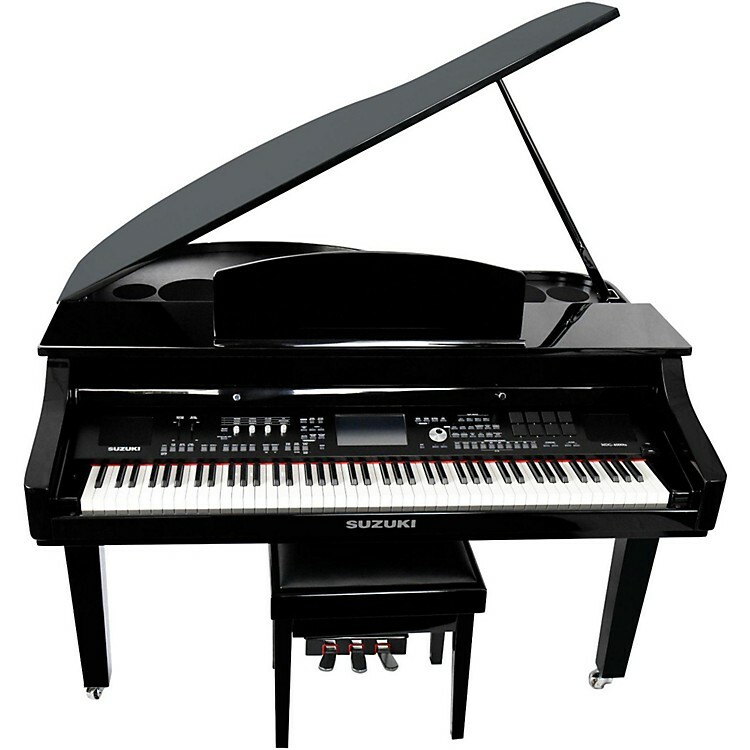 The new Suzuki MDG-4000ts Digital Grand Piano is a serious instrument for the serious musician that will capture your attention the second you turn it on. You won't believe the technology, touch, feel and sound packed into this beautiful Baby Grand Piano. Beginning with the renowned Fatar graded hammer action, velocity sensitive keyboard with 128-note polyphony, quality and attention to detail elevate this instrument among its peers. Maintain complete organizational control using the lighting fast 7" color touchscreen as you work with its 672 selectable voices, 256 GM voices, 240 rhythm styles and 17 drum kits. Its 16 track sequencer can store 500 user songs with huge 32GB internal memory USB drive. Add digital reverb, chorus and adjustable graphic equalizer and you start to understand the enormous capability of the MDG-4000ts. Your music is delivered through a stereo sound system that covers the full range of nuance and expression by driving varied power outputs to just the right speakers. Rattle the windows or whisper every note; the MDG-4000ts will obey your every command. Skilled woodworkers craft each furniture quality hand-rubbed lacquer cabinet with beautiful European chrome hardware to showcase an incredible array of technology and sophistication. And factory direct pricing establishes a new price point for an instrument of this quality. Compare features and specifications to any Digital Grand Piano available today and be amazed at the exceptional value offered by Suzuki's newest piano. Curbside delivery is included. Your piano, delivered and perfect.